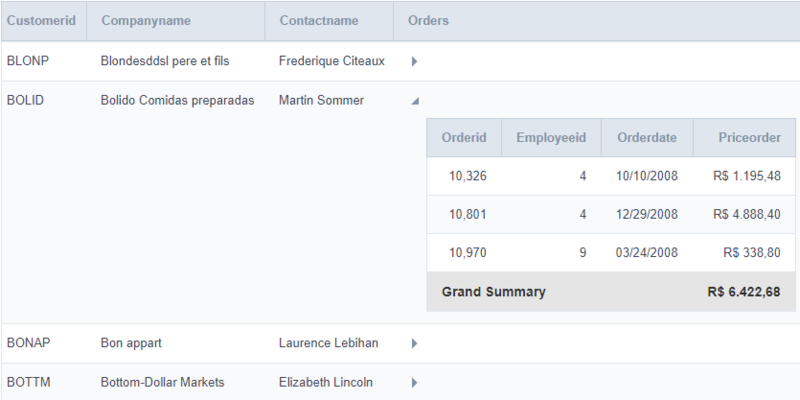 Nested grids are used when you need to display hierarchical data, such as customers and their respective applications. The main Grid encapsulates other Grids, showing in each of its NestedGrids additional data records. 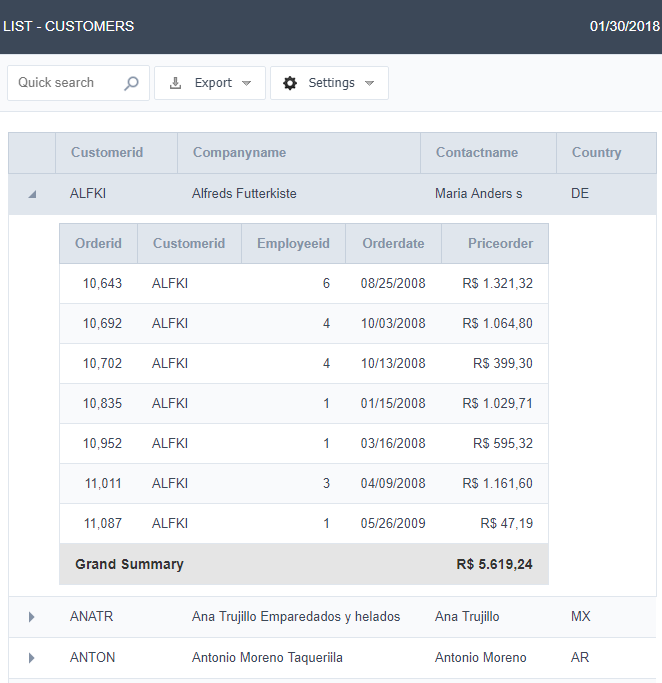 Note the image below in which for each customer is displayed a Nested Grid with its applications. 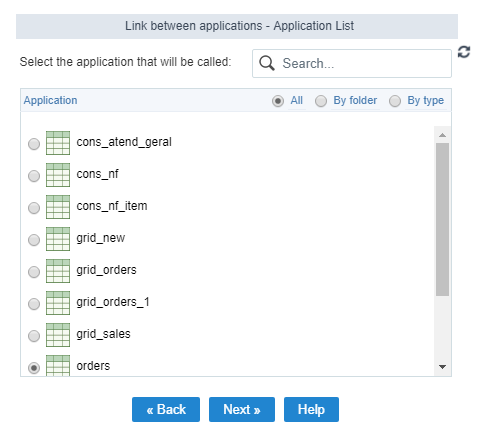 In the application menu, by clicking on the folder NestedGrid > Settings, the general attributes of the NestedGrids can be changed. 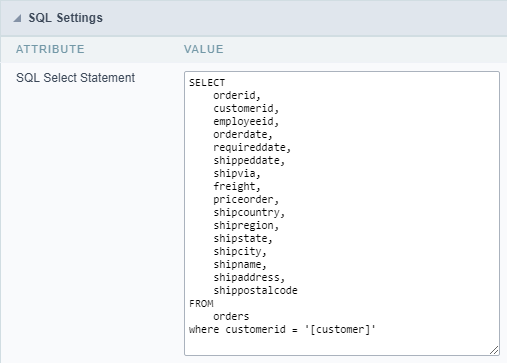 Title in the same line : This attribute enables you to configure the Nested Grid title display. If it is displayed on the same line, the Nested Grid table will be incorporated into the main Grid. 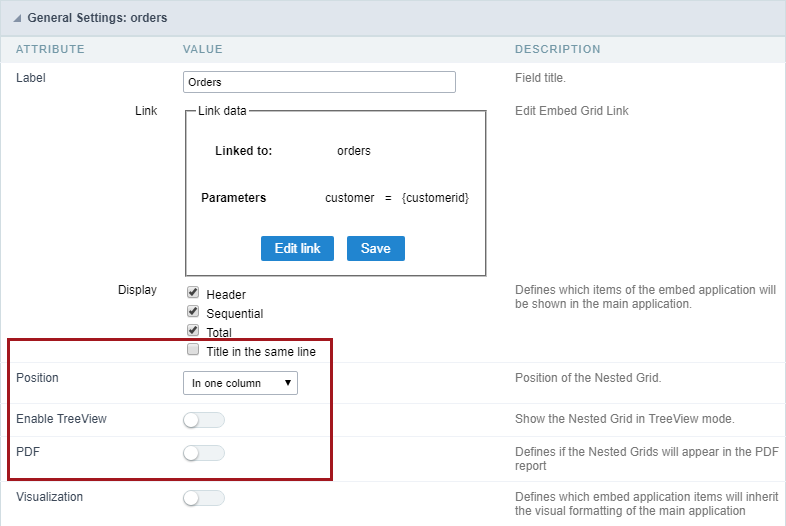 XLS : This option allows you to enable / disable the Nested Grid display in the XLS and XLSX reports. XML : This option allows you to enable/disable the Nested Grid display in XML reports. When selecting this option, the settings of attributes must be performed individually on each of the existing Nested Grid. To create a Nested Grid link, just click on the “New link” within the Link folder. Application list : Have three options for list the applications: All, by folder or by type. by Folder - List all applications of current project, but the applications are separated respecting the project folder structure. by type - List all applications of current project, but separated by type. You can also search by application name in the search field. 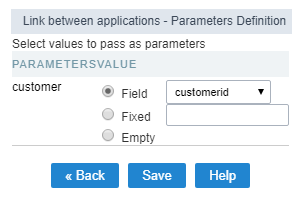 Empty : By selecting this option, no value will be assigned as parameter. All Nested Grid links created will be placed within its menu options, within the “Links” folder. By clicking on the Nested Grid name there will be an interface for settings editing. This is one of the values available for the attributes of the Nested Grid Settings If this value was set for some attribute in the Nested Grid settings, the settings will be made in the Nested Grid itself. Label : Title for the Nested Grid application. Display : Defines which items of the embedded application will be shown in the main application, that if the nested application uses some or any of these resources. Header : Allows to display field labels. Sequential : Allows to display sequential display(number line). 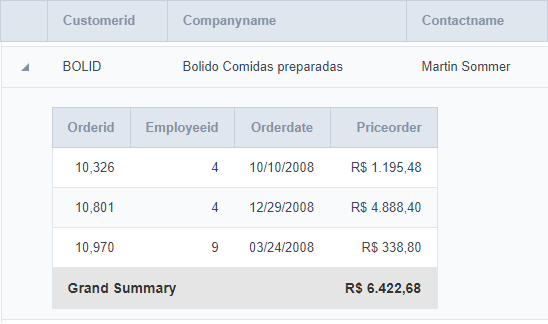 Total : Allows to display the Totals. Visualization : When marked it sets that the Nested Grid view will be equal to that of the main Grid. This settings will only display if all the following conditions are true.